As Christmas gets closer than we’d all like to think, I’d like to take this opportunity to provide you the latest developments in Food Safety. With the recent release of the Food Safety Breaches and Fines List it’s a sobering thought to know that there have been some hefty fines issued to not only food businesses, but also to Food Business Managing entities. This goes to show that even the largest conglomerates are not immune to flawed food health and safety procedures. Make no mistake, Queensland Health is on a war path and there are many restaurants, clubs, pubs and eateries around Queensland that are currently facing Show Cause Notices and the very real possibility of heavy penalties, as well as losing their Food Business Licences. Last year, fines were issued for a number of reasons and ranged from $1,000 for individuals to $50,000 to the business. Issues such as cleaning, hygiene, food safety monitoring, food storage and food safety training were amongst the highest of the fines issued. You need to ask yourself, are you doing everything you can to ensure that the food you serve is safe? You also need to ask how a fine would impact your club’s reputation, as we all know that reputations are hard to rebuild if consumer confidence is low! This article will highlight the most relevant issues regarding club vulnerability, regarding the serving of food to your members and guests. We live in a highly regulated world, involving all sorts of hoops to consider when achieving optimal compliance. The following of and implementation of Food Safety Management Systems or Accredited Food Safety Programs is one of them. Clubs have an aging client base and, as such, the serving of food to people with health problems is a significant risk that must be considered. Your venue should have procedures in place to ensure that the food you serve is safe. In certain circumstances it is a legal requirement that you have a Food Safety Program that is accredited. The monitoring of these programs is of vital importance, especially with regard to any action taken against the Club with regard to a Food Poisoning complaint. Have procedures in place will help to validate that your food operation is doing everything reasonably practical, to ensure food safety standards are maintained. Hospitality workers we are usually time poor and the monitoring of such systems, particularly with regard to maintaining training systems, monitoring cleaning and sanitising schedules and the monitoring of how workers are handling food can drop off the radar. 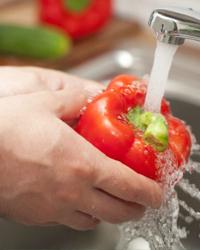 Having simple food safety procedures with easy-to-understand reporting and recording procedures can go a long way in assisting with this element. DWS can assist in simplifying your current procedures, ensuring that line management can quickly and efficiently monitor how your food operation is tracking and maintaining food safety compliance. Training is another important element that needs to be addressed. All persons that handle food in your operation must be trained in the specifics of your establishment’s Food Safety Procedures and/or Program. Their training must be recorded for future reference. You must then confirm, through your Food Safety Supervisors, that all areas are sufficiently monitored, to ensure that food safety protocols are being followed. Kitchen cleanliness – Do you have adequate cleaning and sanitisation procedures in place? Pest infestation issues – a direct result of poor cleaning and poor food storage practices. Basic hygiene principals not being adhered to – Hand washing, suitable clothing not being worn – singlets being worn in a kitchen, jewellery not removed, persons eating no hair nets or hats being worn etc. Basic food Storage Principals not being adhered to – Uncovered and unlabelled food items, poor storage in dry store areas, pest issues, raw food being stored above ready to eat foods – cross contamination issues. Food preparation protocols not being observed – Time and temperature logging procedures and processes not being followed. Ask yourself, can your venue afford to be fined, lose its Food Business Licence and take a direct hit to its reputation? DWS can be engaged to work collaboratively with your food operation so that food handlers can effectively manage food safety at your venue. For assistance please contact our team 07 3878 9355.